Video may have killed the radio star in the 1970’s (insert The Buggles 1977 music hit here), but video technology is proving to be beneficial to job seekers today. It’s not just the job applicant’s who can benefit from video resumes and interviews. Hiring Managers are getting something out of the video interview process also. Time. Interviewing for a job via video is on the rise. Many employers and hiring managers are becoming more comfortable with the idea because it actually can shave valuable minutes from an interview. With easy availability to Skype and FaceTime, video conferencing and interviews are easily accessible. It’s just a matter of being creative, standing out and catching the Hiring Managers attention through the screen, instead of across the table. Hiring Managers are using video interviews in place of phone screening. Skype, Facetime or other live video streaming apps allow a more visual look into the person you’re considering for the position. The phone only gives the interviewer an audio impression of the candidate. Video provides a closer look at body language, appearance and confidence. Sometimes facial expressions and body movements can let the manager know if the person applying is everything they claim to be. The phone doesn’t provide that insight. Technology can also help hook a potential job candidate who has applied for a job with your company. The applicant may be someone who is highly sought-after but showing he or she that you are up-to-date with current trends can do wonders for selling your company’s brand. Set up the video interaction in an environment that is warm and inviting to the person on the other end. Make sure you also look presentable and are prepared with your questions and notes. If other team members are part of the process, remind them they are a part of the company impression that will be left with the applicant. In a recent survey, 60 percent of those who were interviewed via video preferred the experience to any other kind of interview. It really is on the rise. Video interviews are mobile now and can be done anywhere there is internet access or data service. This can be a huge money saver without paying for transportation, lodging and meals for an out of town candidate. The process also does not have to interfere with the interviewer’s schedule. Business trips, vacations or other responsibilities can be fulfilled and the hiring process doesn’t have to take a backseat. This can also be impressive to someone considering your company in terms of the travel and other benefits that come along with the job. The technology is available and it’s not going away. Now is the time to embrace it and add a new tool to your hiring arsenal. Kandi Chapman is a blogger on topics related to employment background screening, company culture and human resources. 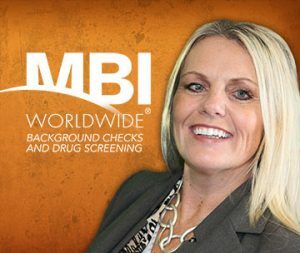 She is President and Founder of MBI Worldwide, a global employment background screening company. Kandi is the recipient of the 2014 Silver Eclipse Award for implementing a positive company culture within her organization, and was honored as one of St. Louisans Top 100 People To Know in 2015.